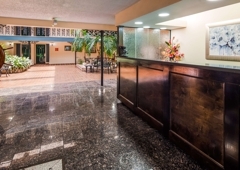 At the SureStay Plus Hotel by Best Western Baton Rouge in Baton Rouge, LA, you’re sure to find great value and modern convenience. SureStay® Plus Hotels by Best Western are redefining affordable value through upgraded standards, consistent quality, and great service. With a stay at Chateau Louisianne Suite Hotel in Baton Rouge, you'll be minutes from Theatre Baton Rouge and close to Bon Carre Business Center. This hotel is within close proximity of Circle Bowl and 48th Street Park. Very satisfied. Off the beaten path but still easy access to all attractions. Breakfast was really great!! Overall, we really enjoyed our stay! Nice older Hotel. Large rooms in very good condition. Well Decorated lobby and room. I booked this hotel on the internet after reading other reviews. I can heartily recommend this hotel which is not a typical hotel! The Chateau made our stay very pleasant, the room was wonderful, spacious, quiet, and clean; the king-sized bed was great with the pillow top mattress, and everything was clean. The breakfast buffet was good, nothing special but plentiful and fresh. But what was the best was the staff; they were extremely friendly and helpful, smiled and greeted us by name. From the manager to the desk clerk to the housekeeper they did everything they could to make our stay outstanding. I had only booked one night but we stayed an extra two nights and then came back and stayed two more nights before flying home. The hotel was about 10 minutes from the airport and 20 minutes to downtown Baton Rouge. Brian was very helpful from the beginning to the end. The entire staff was great during my visit. Thank you to each and every one of the staff. The staff at Best Western is very nice people. I had the best care here and would definitely recommend all my friends and family members to stay at this hotel. Thank you very much. 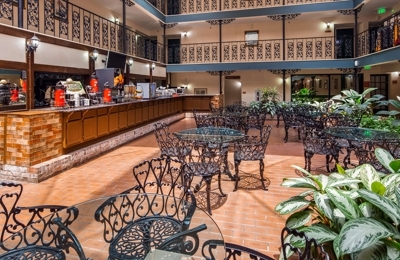 This is a small hotel in the downtown area and is very well kept with a terrific staff. The room was large with a very large restroom and was clean and nicely decorated. It was also handicapped accessible. The decor was old French style and very attractive. All of the rooms open to the lobby area and a nice breakfast is included. The room was very quiet and comfortable and we would stay there again. We highly recommend this hotel to everyone. The price was very reasonable. The staff was very pleasant and friendly....the breakfast in the morning was delicious. We were pleased that the entrances to the rooms were all from the inside of the building. This hotel is A GEM! A small, but reasonably priced hotel, in the Louisiana capitol, it gives one the feeling of being back in the days of the Old South. This was a real FIND. THE LOCATION WAS GOOD FOR ALL THE FUNCTIONS WE WENT TOO. THE STAFF WERE ALL HELPFUL AND I HAVE SENT AN E-MAIL TO THE HOSTESS ON DUTY MOST OF THE TIME DURING OUR STAY, THANKING HER FOR HER EFFORTS ON BEHALF OF MY PEOPLE. Felt very safe and secure in my surroundings! Staff was very, very nice! Bed was very comfortable....room overall was pleasant. The only thing I took issue with was dust build up on counter tops but other than that my stay was wonderful!!! really liked the look of the lobby and internet access was great. also liked the room; however, the shower was terrible. i'm not sure if it is because of water or water pressure. if ever in baton rouge, i would consider staying there again. Very enjoyable. Nice staff. Great breakfast bar in morning and fresh fruit.. Laundry available pay to wash and dry for free. Rooms very nice size. Wifi available and a small business center. Priced reasonable. It was very nice and I was very pleased with the comfort of the room and the wonderful staff very quiet, clean and comfortable. Breakfast was great. Good location easy to get to freeway, shopping and restaurants. Hotel staff was extremely polite and helpful. I was pleasantly surprised at the French Quarter ambience and comfort of this hotel. I thoroughly enjoyed my (short) stay and will return next time I am in Baton Rouge. Loved the courtyard feel of the atrium. My husband and I have stayed at five different Days Inn from Florida, Georgia, etc. and a Best Western in Kentucky. They ALL should use the Days Inn Joplin as an example of what a hotel should be. The rooms, the lobby, the staff and the breakfast were 1st class. Thank you.